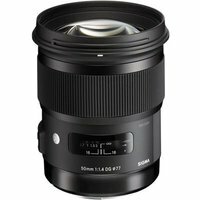 The Sigma 50mm f1.4 DG HSM Art is a high-performance lens to join the Art line within Sigma's Global Vision series. Ideally suited for both photo and video use, this standard-length prime employs Special Low Dispersion (SLD) glass and Sigma's Hyper Sonic Motor (HSM) system to achieve fast, silent AF and the highest resolution and exceptional rendering performance, even near the edge of the image. Furthermore, the lens firmware and adjustment parameters such as focus can be updated with the use of the Sigma USB Dock (available separately).